These original Episode I Action Figures were produced 1998-1999 and had a red card back with a picture of Darth Maul, called "Episode I Red Cards." 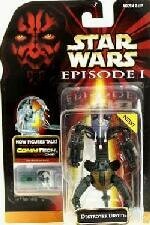 Collectors also call these, "EPI" (short for Episode I), and "Commtech Cards" because each specially marked card comes with a small self-contained computer "Commtech" chip in a hard protective sealed transparent shell. Each Commtech chip contains recorded messages, and/ or movie sounds, and actual character voices from the figure shown in each package! A Commtech Reader is necessary to hear character voices, movie sounds, or other messages on the Commtech Chip. Commtech Readers are also available here and in our Accessories store. Episode I Commtech (blister yellowing - We find this to be very common with this particular figure). This figures does not have a "video sticker" shown in upper left corner. Action figure accessories for Episode I 3 3/4" (standard sized) action figures. Underwater pack found only in this set. Dark Joints with "Slash Damage"
Note:"Slash damage" is a painted variation effect. No damage to figure! Dark Joints with "Blaster Only Damage"
Note:"Blaster damage" is a painted variation effect. No damage to figure! Dark Sand Color w/ "Variant Battle Damage"
Note:"Battle damage" is a painted variation effect. No damage to figure!